William Kenneth Alphin (born November 1, 1963), best known by his stage name Big Kenny, is an American country music singer. He and John Rich comprise the duo Big & Rich, who recorded four studio albums and charted fifteen singles on the Billboard Hot Country Songs chart. Before Big & Rich, Big Kenny recorded a solo album Live a Little for Hollywood Records in 1999 (although it was not released until 2005) and fronted a band called luvjOi. He has also written or co-written several of Big & Rich's songs with Rich, as well as singles for Gretchen Wilson, Jason Aldean, McBride & the Ride, and Tim McGraw. His first solo single, "Long After I'm Gone," was released to country radio on August 3, 2009 from the album The Quiet Times of a Rock and Roll Farm Boy. In 2010, his second solo album, Big Kenny's Love Everybody Traveling Musical Medicine Show Mix Tape, Vol. 1, was released but did not produce any singles. Alphin was raised on a farm in Culpeper, VA. In Nashville, he found work at Famous Music. Before Big & Rich, Big Kenny was signed to Hollywood Records in 1999 and recorded the album Live a Little for the label. The album's release was delayed repeatedly, and was ultimately canceled, with Hollywood Records retaining control of the songs for five years and ultimately releasing it in 2005. One of its songs, "Under the Sun", was featured in the soundtrack to the 2001 film Gun Shy. After departing the label, he founded the band luvjOi, which included Adam Shoenfeld (guitar), Larry Babb (drums) and Justin Tocket (bass guitar). Although luvjOi had a degree of local success, including the single "Discoball" and two albums, the band eventually broke up. By this point in his career, Big Kenny had befriended John Rich, formerly the bass guitarist and co-lead vocalist of Lonestar. The two founded Big & Rich in the early 2000s after years of collaboration, including co-writing McBride & the Ride's 2002 single "Amarillo Sky" as well as "She's a Butterfly", an album cut for Martina McBride. Big & Rich signed to Warner Bros. Records in 2004. The duo recorded three studio albums for the label: Horse of a Different Color (2004), Comin' to Your City (2005) and Between Raising Hell and Amazing Grace (2007), as well as two EPs and ten singles, including the Number One hit "Lost in This Moment". In 2011, Kenny rejoined John Rich to release the single Fake I.D. Big & Rich also founded the MuzikMafia, an association of singer-songwriters which also included Shannon Lawson, Gretchen Wilson and Cowboy Troy. Big Kenny went on hiatus in 2008, as Kenny had to rehabilitate a neck injury that occurred when he was hit by a drunk driver in 2001. He launched his official online community at www.bigkenny.tv in mid-2009. There, he made his first solo single, "Long After I'm Gone", available as a free download. It was released to radio in August 2009 as the first single from his second solo album, The Quiet Times of a Rock and Roll Farm Boy, which was rated number 13 on the 30 Best Country Albums of 2009 by Roughstock. Kenny also became a judge on the television talent show Can You Duet. Kenny released several non-album singles during this period. In 2009 Big Kenny started his own record label: Glotown Records. Big Kenny's role within the label is to serve as Chief Imagination Officer while the rest of the label is composed of Bigger Pictures Entertainment, RMP Management, and CAA Booking Agency. The label was launched in an effort to make music that changes lives. Glotown's first non-album online release, "Cry With You," was released on February 15, 2009. On April 16, 2010 Big Kenny launched his first solo nationwide tour, the Love Everybody Traveling Musical Medicine Show. The tour launched in Agora Hills, CA at the Canyon Club and introduced the world to Big Kenny's new band: ex-Counting Crows and Third Eye Blind drummer Steve Bowman, guitar virtuoso Jesse Howard, former Will Hogue multi-instrumentalist Devin Malone and Nashville veteran Jerry Navarro. That same year, Big Kenny released his second solo album, Big Kenny's Love Everybody Traveling Musical Medicine Show Mix Tape, Vol. 1 as a tie-in to his tour. It was sold exclusively through BigKenny.TV and BigSouthMusic.com. Kenny has also written or co-written several of Big & Rich's songs with Rich, as well as singles for Gretchen Wilson, Jason Aldean, McBride & the Ride, Martina McBride and Tim McGraw. 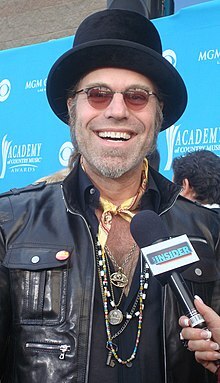 Big Kenny's co-writing credits also include "Here for the Party" for Gretchen Wilson and "Hicktown" for Jason Aldean (who also released a cover of "Amarillo Sky"). He is also the sole writer of Tim McGraw's Number One hit "Last Dollar (Fly Away)". On January 23, 2005, he married Christiev Carothers. She has two sons from a previous marriage: Christopher Carothers, Cameron Carothers, and together they have one son, Lincoln William Holiday Alphin, born on November 2, 2005. On September 17, 2010, Big Kenny and Christiev announced they had adopted a second son, Dakota Jefferson Holiday Alphin, in July 2010. In January 2010, Big Kenny traveled to Haiti to assist in the rescue efforts in the aftermath of the 2010 Haiti earthquake. ^ Murray, Noel (2000-10-16). "Feeling the Luv After departing Hollywood Records, Alphin moves on". Nashville Scene. p. 2. Archived from the original on 2009-11-14. Retrieved 2009-07-11. ^ Phares, Heather. "Gun Shy Soundtrack review". Allmusic. Retrieved 2009-07-11. ^ a b Loftus, Johnny. "Big & Rich biography". Allmusic. Retrieved 2009-07-11. ^ Bjorke, Matt (2009-12-30). "The 30 Best Country Albums of 2009". Roughstock. Archived from the original on 2010-01-01. Retrieved 2009-12-30. ^ "News : Headlines : Big Kenny Balances Solo, Duet Lives : Great American Country". Gactv.com. 2009-08-31. Archived from the original on 2012-09-03. Retrieved 2012-03-28. ^ "Big Kenny Announces Staff Of 'Glotown/Love Everybody'". AllAccess.com. 2009-08-25. Retrieved 2012-03-28. ^ "Big Kenny Announces Digital Release of 'Cry With You' - Press Release". Ereleases.com. 2010-02-15. Retrieved 2012-03-28. ^ "Something BIG in Store for BIG KENNY - NASHVILLE, Tenn., April 12 /PRNewswire/". Tennessee: Prnewswire.com. Retrieved 2012-03-28. ^ "Big Kenny Adopts Son Dakota Jefferson – Moms & Babies – Moms & Babies - People.com". Celebritybabies.people.com. 2011-06-29. Retrieved 2012-03-28. ^ "Big Kenny delivering school supplies to Sudan". Country Music Television. 2007-10-19. Retrieved 2009-07-21. ^ "Big Kenny Album & Song Chart History - Country Albums". Billboard. Prometheus Global Media. Archived from the original on 14 May 2011. Retrieved May 18, 2011. ^ "Big Kenny Album & Song Chart History - Billboard 200". Billboard. Prometheus Global Media. Archived from the original on 14 May 2011. Retrieved May 18, 2011. ^ "Big Kenny Album & Song Chart History - Country Songs". Billboard. Prometheus Global Media. Archived from the original on 14 May 2011. Retrieved May 18, 2011. ^ "CMT : Videos : Jaron and the Long Road to Love : Beautiful Lies - Featuring Big Kenny". Country Music Television. Retrieved June 7, 2011. Pruett, David B. (2010). MuzikMafia: From the Nashville Scene to the National Mainstream. Jackson, MS: University Press of Mississippi. Wikimedia Commons has media related to Big Kenny.